AVID, Advancement Via Individual Determination, helps schools and teachers make learning more meaningful and engaging. Research tells us that the most powerful influence on academic achievement is a caring teacher. When students care and connect to both their learning and their teacher, they will succeed! Putting future leaders on an early path to success in school AVID Elementary engages young learners and provides them with the critical skills to become confident, independent thinkers who have a thirst for learning. 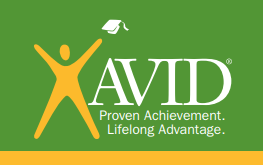 For additional information, download the AVID at a Glance for Parents flyer.